Last year I had a bunch of left over boxes, so instead of throwing them out I decided to build a Halloween costume. The shape of the box immediately made me think of a school bus. Once I began, several different variations and classic movie/TV characters, which suited the idea, came to mind. Lots of bus drivers came to mind, but Otto was my favorite choice. When I showed up at the Halloween nightclub party, there were literally hundreds of awesome costumes, but my costume was the hugest, most popular attraction. Everyone was so excited. They even wanted to take pictures with Otto (me). 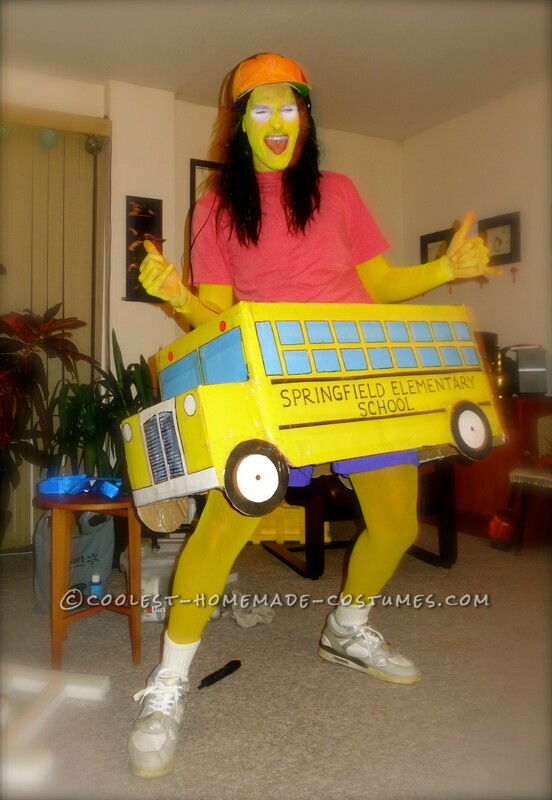 My school bus made the perfect accessory. My design, which fitted snug around my waist, allowed me to dance without having to take it off. It actually was the perfect prop, which I was able to use like an air-guitar, as well as a drum that I could pound the sides. I stayed in character the whole night. It was an incredible and memorable night. It was so successful I have a series of costumes planned for the year and next. Several friends have also asked me to help build them costumes. Every year most people spend at least $50 dollars on common generic commercial costumes with very little character and personality behind them. Sure lots of them are super cool, but I pulled it off with spending just fraction of that. Most importantly I had a ton of fun making this costume. All I had to purchase was a variety of different colored poster paper, lots of scotch tape, lots of yellow face paint, a black wig, and two pairs of yellow tights. I cut a hole the crotch and feet of one pairs and used it as a top. The costume was surprisingly simple, other than the school bus.